Salmon with the piece on Wednesday. Lucy Gellman Photos. First the funding was in question. Then it wasn’t clear it wouldn’t come through at all. Now, the project has moved forward without all of it—and a 12-foot obelisk has made it onto the New Haven Green. That’s the story behind “Lighthouse,” a 12-foot, nine-sided glowing blue-white obelisk by installation artist Ted Salmon. Earlier this week, the Green Light Project-funded piece made landfall on the New Haven Green in time for the city’s annual tree lighting on Thursday. It will be up through Jan. 6 (also Three Kings Day) before going back into storage for a year. The original design. Green Light Phoject Photo. The project has been over two years in the making. In spring 2015, YHC President Chris Stedman and Director of Operations Nancy Kelly met with Debbie Hesse and Cindy Clair of The Arts Council of Greater New Haven, and decided to "keep the Arts Council appraised of the project and to take all their advice in pursuing it, which we did," Kelly said. Then in Fall 2015, the Yale Humanist Community drafted and opened an RFQ for a seasonal sculpture on the Green, a symbol for humanists and nontheists who don’t identify with the Christmas tree, Nativity from the Knights of Columbus, and giant menorah that go up each December. They also met with the Committee of the Proprietors of Common and Undivided Lands at New Haven, working to make sure the location worked for the sculpture. In February of the following year, the group picked Salmon, an installation artist and builder from East Haven. His design entailed a nine-sided incandescent obelisk that would stand 15 feet high and house a time capsule with New Haveners’ pictures, words and “hopes for humanity” inside. The plan was to raise $40,000 through crowdfunding, and have the installation up by December 2016. That didn’t happen. Not on schedule, at least. An Indegogo campaign raised $17,418, and December 2016 found the group celebrating the piece with a cardboard mock up on a sun-soaked Green. But the project continued, receiving multiple grants and individual donations, as well as funds through a "Humanity Calamity" raffle and fundraiser. Salmon reworked his design for a modified version with galvanized steel, aluminum plating and opaque fiber board. Steel supplier Chapin & Bangs jumped in to cover some of the material costs. 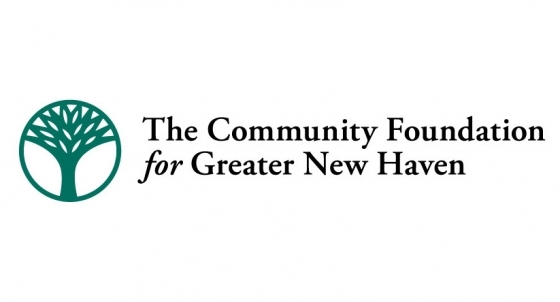 On the YHC side, a grant came through from The Community Foundation for Greater New Haven that helped move the project along. Green Light Project Chair Nancy Kelly did not comment on the amount of the grant. Salmon picked and chose what he could still do on a limited budget. Hand-rendered line drawings instead of silhouettes in relief. Nine people-sized cutouts, based on real New Haveners that Salmon met, measured and interviewed. No heat-activated motion sensor and changing colors, but a white light for dusk and dark, to shine alongside the holiday tree, ferris wheel, and menorah. Now, it is here in a modified, scaled-down version. On each side, Salmon has hand-drawn scenes inspired by a different New Haven neighborhood or community hangout. The lobby of the Yale University Art Gallery sidles up to the Freddy Fixer Parade, marchers caught mid-gesture. There’s a vignette of the New Haven Free Public Library beside a small segment of the Farmington Canal trail, or another of the East Shore Park. In the only drawing with color, community members gather as fireworks light up the New Haven sky. Salmon has included a portrait of himself and his kids, in a scene from the Prospect Street community garden. Salmon said he ultimately chose to focus on New Haven, rather than the greater New Haven area, because the project felt so local from its outset. The aesthetic, he added, is still meant to be universal. In an email, Kelly insisted that the landmarks in fact do represent greater New Haven, as well as the city itself. "Sleeping Giant is in one of the etchings; the water and sailing is indicative of the entire shoreline not just the harbor (which includes the City of West Haven regardless)," she wrote. "The Farmington Canal segment is from an area in Cheshire (or possible northern Hamden). The community gardens are every community garden, like the Massaro Community Farm in Woodbridge or the Dudley Farm in Guilford. Woolsey Hall draws people from far and near." Structurally, Salmon said he was inspired by the architectural features of the lower Green. There are the space’s two fountains, one in the center and the other at the corner of Chapel and Church Streets, whose uses shift from season to season. One one side of the Green, he was fascinated by church spires, working their upward momentum into is nonagonal design. He also looked to the courthouse across the street, hoping its stately white design would vibe with the sculpture’s white light. He said that finishing the piece this year carried a certain kind of new urgency. Salmon isn’t religious; he described himself Wednesday as “as close to being an atheist without declaring it.” When he landed the commission in spring of 2016, he was just becoming more interested in sculpture with a social justice slant. Then Trump was elected, and Salmon kicked his work into high gear. But not all members of the Yale Humanist Community feel that way. In a follow-up email to The Arts Paper, Kelly explained that "The sculpture is most definitely not a political statement against our nation's President ... the sculpture was specifically commissioned by YHC and the design was signed off by YHC every step of the way to be sure it reflects the spirit of community, warmth and hope. " "The sculpture represents that everyone has a voice and beliefs whether we agree with them or not, everyone is represented and included," she added. "Humanity in all its glorious pros and cons, foibles and failings as well as its compassion, intelligence, vibrancy and spirit are acknowledged as part of the community-package. People with different opinions, different approaches to life are all included in the hope and warmth of the sculpture. This sculpture is the antithesis of judging and dividing people." The project started under YHC Director Chris Stedman, who has since left New Haven. Reached by phone on Wednesday, he said he was excited about the project and was sorry that he wouldn’t get to see it. On Thursday night, the project stood at one end of the Green, framed by the newly lit Christmas tree and ferris wheel. As parents milled elsewhere, three kids ran around it game of tag, laughing loudly in its small circle of light. A line for Santa photo-ops formed nearby. When asked for comment, they laughed, and kept on running.